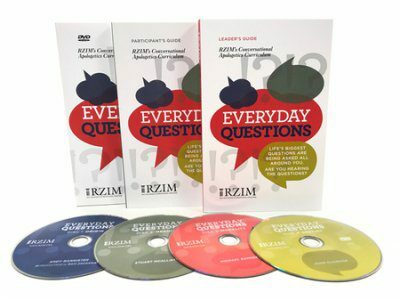 Featuring Ravi Zacharias, Abdu Murray, Michael Ramsden, Stuart McAllister, John Njoroge, and Andy Bannister, Everyday Questions is RZIM’s small group curriculum designed to equip Christians in evangelism. The video sessions are all less than thirty minutes and the accompanying discussion guides will lead your group in conversations about how to respond to people around you who are looking for answers. Life’s biggest questions are being asked all around you. Are you hearing the questions? Are you ready for the conversation? Collaboratively developed with input from the senior pastor of a growing evangelical church, Everyday Questions will prepare your ministry’s small groups to faithfully love their neighbors and share the gospel in today’s complex and ever-changing world. The Everyday Questions starter kit includes four DVDs with nine lectures, a leader’s guide, and a participant guide. Additional participant guides are available so that every member of your group, whatever the size, can have their own book for the small group discussions and weekly challenges. You’ll also receive professionally designed digital materials to promote your ministry’s Everyday Questions groups, including a screen slide, poster, and half-sheet formats.